Couesnon Flugelhorns are some of the most sought after flugels because of their characteristic sound and response. Unfortunately the most common problem with these horns is with the leadpipe. Problems range from mouthpieces not fitting correctly, to inaccurate attacks and questionable intonation. Gary Radtke and Charlie Melk have worked together to develop a solution. The GR / Melk Couesnon Flugelhorn Leadpipe. 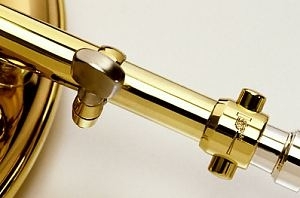 This leadpipe accepts any standard GR taper flugelhorn mouthpiece. It will not accept straight "French" tapered shanks. Play testing this leadpipe showed immediate improvement in soft attacks and intonation. All aspects of the Couesnon Flugel were improved. Our Standard "In Stock" pipes have 4 7/8" of engagement into the horn. These can be cut to match your existing pipe. Please contact us when ordering. As Couesnon leadpipes vary in length, please measure the ENGAGEMENT of the leadpipe into your horn when placing your order. This measurement does not include the tuning nib on the receiver end of the pipe. GR /Melk Flugelhorn Leadpipes will also fit Olds Clark Terry Model Flugelhorns and Blessing Artist Models.